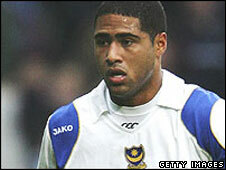 Two members of Portsmouth Football Club's winning FA Cup squad have had their winners' medals stolen. England defender Glen Johnson, 23, and goalkeeper Jamie Ashdown, 27, had their medals taken from Oakley Court Hotel in Windsor, Berkshire, during the weekend. Johnson's went missing from his wash bag while Ashdown's was in his jacket which was stolen from the team hotel. Portsmouth chairman Peter Storrie said the people responsible had "deprived our players of a lifelong dream". Thames Valley Police confirmed the medals had been reported stolen on Monday. Johnson, who played the full 90 minutes of Portsmouth's 1-0 win over Cardiff City, found his medal missing when he returned to the hotel after Sunday's victory parade. He said: "We checked out of the rooms on Sunday and left our bags in a safe place to collect them after the parade. But when I got back it was gone. "I'm just so disappointed. I'm just keeping my fingers crossed someone's going to give it back." Goalkeeper Ashdown, who was a substitute for the final at Wembley, said his jacket, which contained the medal, went missing after he left it hanging on a chair at the hotel. Portsmouth chief executive, Peter Storrie, said: "If someone has taken these medals, they have deprived our players of their lifelong dream. "Clearly someone has come in from outside knowing that these medals were about and focused on taking them."